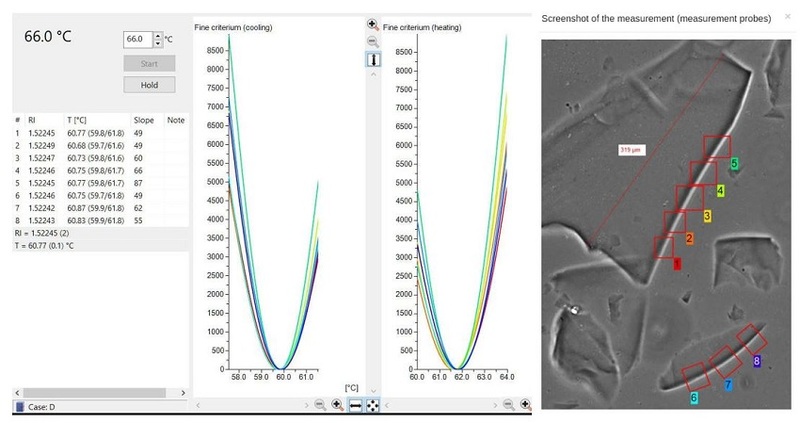 RI has been designed as a complete solution to forensic analysis of small glass splinters by the immersion method. The system was developed in tight cooperation with forensic specialists on glass analysis to provide precision, reproducibility, and high comfort of work with both hardware and software. Small glass splinters are immersed in silicone oil and put inside the hot stage and under the microscope. Phase contrast optics guarantees high image contrast, live camera image enables fast image focusing. Then, the Becke line disappearance temperature is detected automatically and a video file of the heating and cooling phase of the measurement in the temperature interval is recorded. Up to 20 probes with changeable size and rotation can be placed to the image to define measurement positions. RI software uses a precise algorithm for refractive index determination to calculate resulting refractive index statistics based on probe positions. Refractive index can be re-measured using the recorded data without the necessity of repeating the heating and cooling phases. The results are saved to a structured database along with measurement details and environmental conditions. A chart for visual comparison of the case-related data is created. Precision of measurements is ensured by calibration via glass standards. Long-term stability can be checked by periodic measurement of a glass standard (e.g. K5). The stability is then visualized in a stability graph plot.